Editor’s Introduction: When Tzu Chi volunteers from around the world traveled to Taiwan for their volunteer certification, having completed their training in their local area, Dharma Master Cheng Yen not only certified the volunteers personally, but spoke with them on several occasions to offer her guidance for walking the Tzu Chi path. The volunteers, being of different nationalities, ethnicities, and faiths, were nevertheless united in the common mission to serve and alleviate suffering in their community. Below are selections of Master’s teachings to the volunteers. Today, your certification as a Tzu Chi commissioner or Tzu Cheng Faith Corps member is, I believe, the culmination of a journey of many years, starting from when you first learned about Tzu Chi and began getting involved as a donor or a volunteer. Then, as you learned more about Tzu Chi through your personal involvement, you were inspired to become more committed and entered training to become a certified volunteer who will take up Tzu Chi’s mission. This journey was probably at least three years in duration, perhaps even more for some of you. So, today, you have finally arrived at this milestone of your certification. Being certified, however, does not mean you have reached the finish mark. Actually, now is the real beginning. 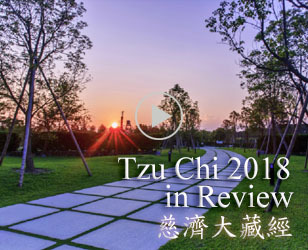 It is now that you will start to actively take on Tzu Chi’s mission and walk this Dharma path, learning to live according to Jing Si principles and carrying on Tzu Chi’s mission by working in the community. As this is just the beginning, please go forward on the path diligently and earnestly. Actually, as a human being in this world, we don’t really know how we came to be here or what we are here for. Looking at other people, we compare and think, “How come they have such good fortune while I don’t?” We have many ‘whys’ about life. We all want a perfect life. We want everything to be ideal. But, is that possible? Even the very wealthy can’t always have what they want or have things turn out as they wish. So, in life, there are many things we cannot control. Why is life the way it is? When I was young, I had many questions, especially after I was confronted with life’s transience in the experience of my father’s sudden death. He was a hearty, healthy man, but suddenly one day, he had a stroke, and within twenty-four hours he was gone from the world. Just the day before, he was still enjoying a wonderful life, surrounded by family who loved him. But less than two days later, he was lying in the ground in the cemetery. I remember the day we returned home from the cemetery having buried him, it started raining hard. There was thunder and lightning. There he was, all alone in the cemetery amidst the fierce storm—no matter how many people had just attended his funeral and how well-respected and influential a figure he was in the community, he was now all alone there in the cemetery, everyone all gone. At that time, as it rained and thundered and the sky flashed with lightning, I was hit by the thought—why? Why is life like this? What is this thing called life? What are we here for? Where do we go after we die? Such a stark incidence of impermanence stunned me and overwhelmed me with questions. I started searching. I persisted with these questions. I was determined to find the answers to life. So, now when I keep talking about how one second can set the course of our life—that actually comes from my experience from that time in my life. That one second when I was hit by the deep shock of impermanence and compelled to know the answers to life—that was the turning point that determined my life’s direction and changed the trajectory of my life. It was that which made me search and find the Buddha’s teachings, and then start walking on another path, the enlightened path. The more I learned of the Buddha’s teachings, especially after I became a monastic, the more I started to appreciate how real and boundless the Buddha’s wisdom is. The Buddha really knows the workings of the universe and the laws of life and existence. His teachings point out to us life’s correct course and help us to have the right direction in life. He has allowed us to know that our current good and bad fortune are results of the karma we created in the past. So, we only need to look at our present life to know whether we created good or bad karma in our past life. To know how our future life will be, we only need to see what we’re doing now in this life. If in this life, we are giving of ourselves and making positive contributions that benefit others, then in our next life we will certainly have a life of blessings and wisdom. So let us walk the Bodhisattva Path now, in this life, and cultivate blessings and wisdom. Don’t wait until a future life to do it. If we don’t plant the seeds now, how can we reap the conditions to do so in our next life? As each of you volunteers came up to receive your certification badge, some said to me, “Master, I used to be Tzu Chi’s care recipient. 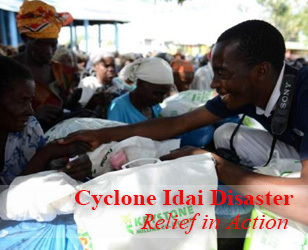 I’m grateful for Tzu Chi’s help.” Hearing this touched me very much. These volunteers once suffered hardship. With the care and help of many loving volunteers, they have transformed their hearts and want to help others by being a volunteer themselves. Their living circumstances actually have not improved much, but their outlook and their mentality have changed. They aspire to help others and want to give of themselves. They have risen above their material poverty to become rich in heart. Indeed, we only need to turn our minds around for us to have a different life. A few volunteers also shared how after encountering Tzu Chi, they became a new person and found new direction in life. Some had lost themselves in gambling and alcohol for a long time. They were not rich to begin with, but to sustain their gambling and alcohol habits, they would go to extremes to find money. Eventually, their addiction drove their families and loved ones away. There were also others who had been unhappy and never felt secure and at peace because despite being well-off, they were always feeling dissatisfied and longed for many more things. 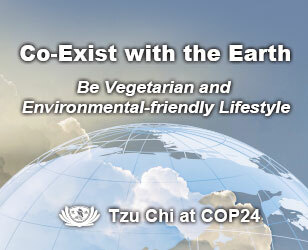 But now, having joined Tzu Chi, their interest is solely on doing good works that help others. The more that they do, the more they themselves change, be it in their values, their temperament, or their behavior. In turn, their family relationships have improved, and now they enjoy a wonderful life full of love and harmony. They said that Tzu Chi saved them and their families. One volunteer, after changing like this, even inspired her past gambling buddies to support charity work; now over 200 people have become regular donating members of Tzu Chi as a result of her outreach. As a human being, we need to be upright, be grounded, and live wholesomely with a clear conscience. Being rich or poor is not the issue—the key is our character. When we are upright and we do good, it creates peace and harmony in our family, in our society, and in our world. Our world is created by the people in it, and whether our world has harmony depends on the mentalities of the people living in it. So, we need to be sincerely pious and learn the Dharma to help turn our hearts toward the good and become a better person, and then with our example, gradually influence more people as well. The flower you are wearing today for your certification is a lotus bud, and it is a reminder to be like the lotus flower. In Nature, lotus flowers grow from the muddy water, yet are unsoiled by it. In fact, the mud is what gives the lotus flowers their nutrients, enabling them to grow well and beautifully. At the same time, the lotus flowers turn the muddy pond into something beautiful. People visit a lotus pond to admire the beautiful flowers, but they would not go there if it were just a muddy pool. Look at our world now. It is very much like this muddy, mucky pond, as there is so much turmoil, chaos, and disorder. This is all because greed, anger, ignorance, arrogance, and doubt are roiling rampantly inside people’s hearts, making them very turbulent and unstable. People cannot settle their hearts down to lead a peaceful and upright life. As a result, the world has turned into a very volatile place, so everyone lives without a sense of security. That is why Dharma is so needed in our world now—it shows a more enlightened path for us all. So besides purifying our own hearts with the Dharma, we need to help purify our world also. This is our mission as bodhisattvas. We also do this because having gained happiness, we wish to help others to stop their own suffering and attain happiness. Because our world has so many problems, we need to go out into the community to help and to create blessings. But, actually, through helping, we will witness all kinds of suffering that open our eyes and makes us see how blessed we are. We will also see the impermanence in life and the suffering there is around us—suffering which is inherent in life. These are life truths that we normally are ignorant of, and we would’ve remained unaware if not for such contact with others. So, in giving, we need to be thankful to the people in suffering, for it is their suffering that teaches us and wakes us up to life’s truths. We need to be very grateful to them and sincerely give of ourselves to help them. In giving, therefore, we need to do it with gratitude, instead of thinking of ourselves as givers or doers of good. We should not expect anything in return, even other people’s appreciation or gratitude—it is we who need to be grateful. If we can be this way, then our mind will be free of attachments. This is the inner freedom that a bodhisattva enjoys. So, by going into the community to give of ourselves and help people, we can gain a lot of wisdom and spiritual growth. That is why I say that the lotus flower, which grows from the mud yet is untainted by it, in fact draws its nutrients from the mud. Walking on the Bodhisattva Path in this world, what we encounter in the course of working amongst people, even living beings’ afflictions and impurities, can help us develop our wisdom-life if we are mindful in learning to see the Dharma behind everything. This is the transformation of afflictions into “bodhi” or enlightened wisdom. Bodhisattvas don’t get tainted by the impurities of living beings because they look deeper to see the laws and principles at work beneath everything and grow in wisdom from it. Because of this wisdom and insight into the Dharma, they can continue to walk their path even more steadily and healthily because with wisdom as their guide, they will be able to keep themselves from being tainted by living beings’ impurities. Then, the more they see and encounter in their interactions with living beings, the more they learn of the Dharma and the more wisdom they develop. So, please strive to be like the lotus flower that grows from the muck and draws nutrients from it to grow beautifully, pure and untainted. Now that you have become my disciples, remember to take the Buddha’s heart and my mission as your own. The Buddha’s heart is a heart of great loving-kindness and compassion, caring for all beings even those unconnected to us and feeling others’ suffering as our own. Meanwhile, my mission is to walk the Bodhisattva Path. We really need to serve as bodhisattvas in this world. May you cultivate both blessings and wisdom and be diligent in walking the Bodhisattva Path every day. Best wishes to you.
" Each time we forgive others, we are, in fact, sowing blessings. The more magnanimity we show, the more blessings we enjoy. "